I just LOVE reading good books and gaining new knowledge. And today’s topic will be on instant vs. delayed gratification and how it can predict your future success in life. I will talk about the landmark experiment on delayed gratification that is very well presented in a wonderful book written by Joachim de Posada. 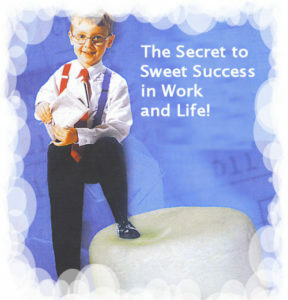 This book is called “Don’t Eat That Marshmallow… Yet!” and, like I said earlier, its point is to share an incredible experiment that was done in Stanford a few decades ago. This experiment involved little children who were taken to the room, where the scientists would sit them down at the table and put a marshmallow in front of them. “I am going to be back in 15 minutes. If you don’t eat it right now, then I will give you one more when I’m back. In other words, you get double the prize”. (Note: I am paraphrasing here as I read the book in the original language – Spanish). Following this, the scientists who conducted this study watched children’s reaction and recorded the results. and those who waited to get a second marshmallow. From this study, some serious conclusions were made. It turned out that those children who were able to resist the temptation of the momentary pleasure and waited for double results, later in the years achieved a much greater success. At this point, I’d like to include this short video from TED where Joachim de Posada shares a landmark experiment on delayed gratification – and how it can predict future success. I highly recommend reading this book if you want to learn about the principles of success. I think the book will have a powerful influence on you. In this book, the subject is so densely developed. Personally, I read the book in no time. This information isn’t given as a boring scientific theory, but rather in the form of a dialogue between the boss and the driver. That is, the boss, who is a billionaire, was sharing the important principles with his driver. I think you all know people in your life who spend their salary all at once and, in addition to that, get into serious debts. It is that first type of people who want to get all at once, here and now. They are not prepared to wait in order to get better results later on. There is also the second type of people who are willing to sacrifice the momentary pleasures in order to get more benefits later on. While I have my “instant gratification” moments, overall I feel that I fall into this category. You can’t possibly succeed online if you expect quick results with no efforts on your part. If you for example want to start a website business, you need to give it some time to take off. You’ll need to put all the work and efforts and create the quality content now, and then enjoy the good results later on. I believe that patience and time are the answer to every desire. (Again, remember that here I am paraphrasing as I read the book in the original language). The driver, of course, chose the option to have one million dollars instantly. And that’s how most people would act. Similarly to the kids from the experiment, that driver just gave in to his weakness and basically ate his marshmallow right away. …then he would have realized that the second option would bring him a lot more money. This story starts to develop in the book, and you will see other great examples that will blow your mind away. And as the author himself writes, the outcome of this interesting psychology experiment has changed his life. Is this the type of books you enjoy reading? What books you recommend to learn about the principles of success? Have you read Joachim de Posada’s book? If yes, what are your thoughts? 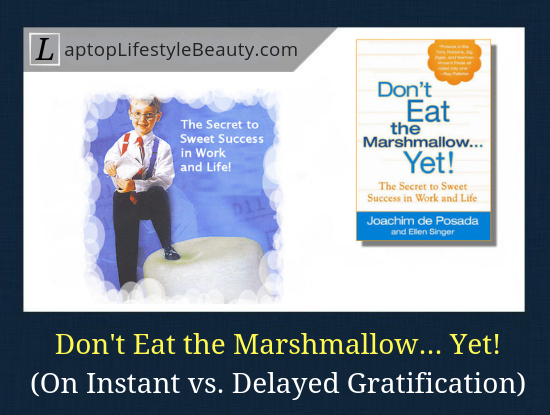 Instant vs. delayed gratification – who will win the battle?